[They] identified a 16th-century Flemish Nativity painting in which one angelic figure appears distinctly different from other individuals in the painting with an appearance of Down syndrome. . . . This may be one of the earliest European representations of Down syndrome. The 1515 Flemish painting, by an unknown artist, . 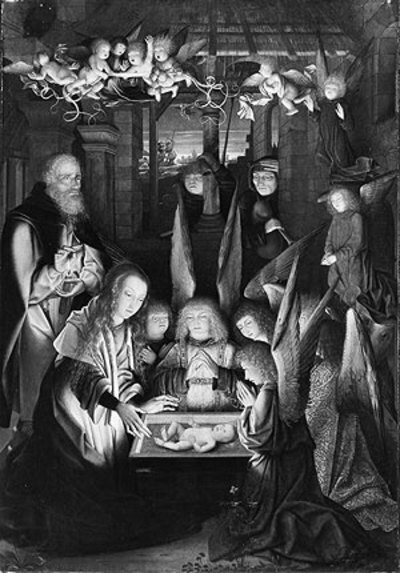 . . shows an angel (next to Mary) and possibly one other figure, the shepherd in the centre of the background with the syndrome. "If our diagnosis is correct, this implies that Down's syndrome is not a modern disease," say [Levitas and Reid] (American Journal of Medical Genetics 2003;116:399-405). The diagnosis of Down's syndrome in the angel was based on a number of features: a flattened mid-face, epicanthal folds, upslanted palpebral fissures*, a small and upturned tip of the nose, and downward curving of the corners of the mouth. The hands, crossed over the breast, have short fingers, especially on the left. *The palpebral fissure is the separation between the upper and lower eyelids. Those two were clearly half-orcs.. You saw a lot of those following the War of the Rings.. Not to mention more than a couple half-halflings.. Thanks to Merry & Pippin.. The Hobbits were a randy lot..
On a more serious note, couldn't those two also be explained by the expression of Neanderthal genes acquired when the Neanderthal population was overwhelmed by the Homo Sapiens? Flattened features.. pronounced brow ridge.. A native dialect similar to the one spoken by the Librarian at the Unseen University.. I don't understand the surprise that Down Syndrome is "not a modern disease." Why would we have thought it was a modern disease? Surely the chromosomes of our ancestors were just as likely to be damaged as our own, no? "Given the distinctive phenotype and prevalence of Down syndrome in the modern era, a number of authors have sought historical evidence of individuals who lived before its initial recognition, particularly in Renaissance and earlier art. Interchanges among various authors were published in the Lancet in 1968. Mirkinson [] hypothesized that Down syndrome was a modern disease, given its apparent rarity in art, and challenged others to find historical depictions of the disorder as evidence against." I think it's more an intellectual exercise than anything.